“Now faith is the assurance of things hoped for, the conviction of things not seen.” Hebrews 11:1 ESV. When the word faith comes up in a discussion, the most difficult aspect is clarifying the definition. Many people in the world and even within the Christian community often use the word interchangeably with belief, trust, or religious affiliation. This most often leads to miscommunication unless one totally understands the other person’s position. Many books and papers have been written on all three topics. Some good, some bad, but all have a perspective worth understanding. So today, rather than kill my readers with technical, theological terminology, we are going to use the student’s cliff note version. For example, when one speaks about a faith community, one is speaking about a group of people who are set apart around certain doctrinal positions that they believe and live out. This is the FAITH of organizational membership. Typically, it is the label and category people box you within. The result is your denomination (or non-denomination which is a denomination). When the Bible writes about FAITH, one needs to clarify from the context which part of faith is being discussed. For when one hears, speaks, or reads about faith, one must look at the context to determine if the writer means a set of doctrinal positions, a mental decision of belief, a secured confidence of trust, or the enabling power of God. First there is the enabling power of God. This Faith is written about in Romans 12:3, 3:28, 5:1, and 4:5. Also Hebrews 12:2, and Ephesians 2:8. Then there is the mental decision based on your perception of reality as defined by God. Also known as your worldview. This Greek word is also translated throughout the Bible as Belief. This is found in Romans 10:17, Romans: 6-10, Romans 12:6-8, Romans 14:1-3, and Mathew 21:21. Finally there is the secured confidence placed in someone or something. We call this Trust. This is explained in Hebrews 11: and 2 Corinthians 10:15 where we place our trust in Jesus Christ the foundation of our faith. The question most often discussed is whether or not faith is something we develop or something we just live out. I believe when one sees the three faces of faith, then one come to realize that it is a gift from God that empowers us. From His gift, we begin to change our perception of reality based on His Word and Spirit, and then learn to walk with Him which results into seeing how He intervenes in our life and in the lives of others. This leads to the building-up of a mutual trust between the Triune God and oneself. So in summary: the gift of empowering Faith leads to the development of beliefs which leads to a more secured relationship with the living God. These are the three faces of FAITH. He said to them, “Where is your faith?” Luke 8:25 ESV. The same question may be asked of you and I multiple times as we face the challenges that life throws us. Where is your faith? Paul writes in I Corinthians 12: 4-11 that the Holy Spirit distributes various gifts to us including faith. Likewise in Romans 12:3 he again writes that God distributes the gift of faith to each of us. Jesus himself stated that all we need is faith the size of a mustard seed to move mountains (Mt. 17:20). One of the fruits of the Holy Spirit is faithfulness (Gal. 5:22). To be full of faith is faithfulness. Faith is a gift from God. God has given each of us a portion as he determines. You may have been given a 100 gallon tank of faith and I only a pint. But we each have the gift of faith. We only need to exercise it. It is also unwise to compare ourselves with someone who has a 100 gallon faith tank when we only have a pint. God knows. Like the parable of the talents, we are to be good stewards of what God has given us and invest for future returns. For me to turn the faith pint into a faith quarter is a 100% return. For the person who has 100 gallon faith tank, a pint return is only a .125% return. So yes the person who has been given much faith, much is expected from him. However, the person who has been given a little faith, much is also expected from him. However, their reward at the finish line will probably be as much and maybe more than many expect. Simply this: God gives us the faith we need to operate under. Don’t compare your faith with each other. Compare your faith with Jesus’. That will keep you humble, dependent on Him, and allow you to maximize your potential as God created you to be. How much faith do you need to live a productive life as a Christ-follower? Whenever I hear people state that we need more faith, I cringe. My reason and encouragement comes from Jesus himself. He rejoices over the fact that we have “little faith.” His claim is with very little faith we can move mountains. There is no shame to have only “little faith.” Faith is faith. Look at Jesus’ statements in regards to having a little faith. We have learned over a lifetime that God is good and faithful. He always delivers on time and in the best method possible. 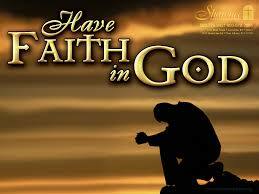 Over the years we have slowly learned that it is not my faith but His faith that helps me through life’s ordeals. Also as we pray and ask, we don’t know specifics of how or when. All we know is God produces good and whatever happens is God taking everyone into consideration. It may not always be best for me in my opinion. But it is best for the advancement of His Kingdom. For example, whenever we have mountains to move in our life and wait patiently for God to provide a solution, isn’t it challenging to wonder how God is going to do it this time? In prior times, he may have sent a person to help us through. He may have “dropped a meteor out of the sky” to miraculously have the mountain flatten. Or he may have simply given us a shovel to start digging and build character and strength through the process. He may even allow our great-great children to continue the process until the mountain disappears. He doesn’t always reveal his plans to us. He simply deals with the issue in a way that we all know He is responsible for the productive outcome. And we are grateful for his involvement in our life. I for one am thankful that my little faith is more than enough that allows us to walk with our heavenly God. So if you have little faith – REJOICE. So many translations; so many different opinions. What is a person suppose to believe? There is debate among Biblical scholars that the verse in Galatians 2:16 is correctly written in the King James Version. Newer Bible versions have altered the meaning by using the word “in” versus “of.” (I have underline the two places above). The problem is the meaning. When we use the word “of” we are placing the emphasis on Jesus’ faith. When the word “in” is used, we are placing the emphasis on our faith. I will leave the scholarly details for those who are better trained to educate. Instead, I will simply say that I lean toward the KJV interpretation because it makes more sense from a holistic basis. 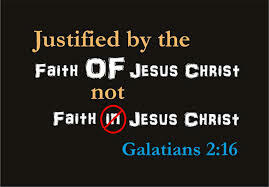 If I am justified based on my faith, than what is the difference between human works of law and human works of faith? Both employ an emphasis on saving oneself by oneself. On the other hand, if I am justified by the faith of Christ, than it is not my work, but Christ’s work. He made it all happen and grants us the grace to accept it. My part is to believe in Him. He lived, died, and was resurrected on our behalf. He is the cornerstone. The faith or trust that I have in Jesus is because He did it, is doing it, and will accomplish it. He made it all possible. Even the faith that I have in him is a gift from him. Through the Holy Spirit, he has empowered us to believe. Yes, I had to acknowledge that Jesus is who he claims to be. Yes, I had to ask for the Holy Spirit. And yes, I submit to the authority of the Father/Son/Spirit. It is a relief that my tiny belief is being upheld by the faithfulness of Jesus Christ. Isn’t that simply a breath-taking, grace-filled, and life-giving fact that makes one more thankful and grateful for our Triune God sharing His life with us without heaping religious burdens on us? I for one am more at peace for placing trust in Jesus’ faith than in my own. How about you? If you probe enough in a person’s narrative, you will find the worldview that the person builds their reality from. Is their foundation for “faith” in happen-chance? a “faith” in self? a “faith” in another person? a “faith” in “big brother?” or a “faith” in “karma?” Wherever the faith is focused toward reveals the person’s source of life and their reality. In political slogans, we are asked to have faith. In business circles, we are asked to have faith. In relationships, we are asked to have faith. Faith is one of those words that has become a generic, abused child. However, when faith is properly employed, reality becomes more real in a person’s life. When faith is built on a true, solid foundation than kingdom reality becomes a life-giving source that makes oneself and those around him/her to flourish. If someone is looking for a Biblical definition of faith, check out chapter eleven of Hebrews. If you want a another practical definition, substitute the words belief and trust in the work of the Triune God every time you come across the faith word. It will give you a more precise meaning of the word faith as used in scripture. But for those whose basis is not scripture, faith is only an empty cliché to distort the power and grace of God. Yet be not surprised, Biblical words and concepts have slowly eroded over time to become a water down version of its original meaning. That is why we all need to become practicing theologians to some degree. My belief and trust is in Jesus Christ. He allows us to take part with Him in His story which is restoring creation back to God’s original intent. He has my back. My belief and trust is built on His faith, His work of salvation, His plans for humanity, and His ability to make it all happen for His goodness and the goodness of all under His dominion. So the next time you hear someone mention faith, be sure you both have the same definition of faith in mind. Otherwise, who is being radical and missing out in the enjoyment of life in Christ?